"God Is Not in Charge"
This “world” inheres in God, most certainly. There Is Only God. But that Realization is the expression of the gnosis that comes through “self”-transcendence. And only in the midst of such “self”-transcending gnosis are you transformed. Only in that case is your vision, or your view, transformed. And only in that case are you, as the “causer” of effects, transformed. 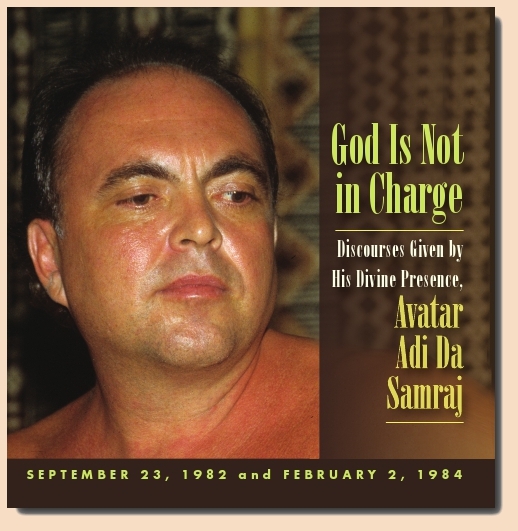 "God Is Not in Charge" is a set of two complementary talks by Avatar Adi Da from the 1980s. In these talks, Adi Da poses various questions about whether there is a God or a Being Who is sustaining everyone and is “in charge” of everything. Through observation and direct experience, Avatar Adi Da says, anyone can discover that this notion of the Parent-God is self-evidently false. In the excerpt included in the link below (track 2 of the CD), Avatar Adi Da extends the consideration beyond the question of whether or not there is such a thing as a Parent-God. He looks at the actual source of this false presumption, which He says is simply evidence of a mind that is “propagandized” by present-day society—a society that is perpetuating an infantile/dependent relationship to existence based on the illusion of separateness. This infantile point of view leads to a profound misunderstanding of how the system of appearances actually works. In fact, as Avatar Adi Da describes, the world is a complex and indivisible system, influenced by all kinds of causes that result in a wide range of possibilities—including the most sublime and the most degraded experiences and conditions for the human being. With this comprehension of the world of appearances that is experienced day-to-day, it is possible to understand why Avatar Adi Da says that you cannot look at the world (in and of itself) and find direct Signs of the Divine Reality. However, He also points to the mechanism by which the Divine Reality is directly Revealed. This is the Function of the Adept-Realizer. Adept-Realizers, to one degree or another, Manifest the Bliss of the Divine Reality, the Source-Condition of all appearances, that is not subject to causes and effects. Adi Da further describes the effect of the Adept-Realizer on humankind: The Adept-Realizer is Radiance—and, therefore, beings feel the Force of the Spiritual Master as an offense to their patterns of contraction. The Love, the Radiance of the Spiritual Master draws the being Beyond contraction, and, ultimately, into the Realization that the world of appearances is nothing but the Living Divine Reality. Later in this CD, Adi Da describes the hierarchical nature of existence, in which there are countless beings who cause effects. He calls every individual to take responsibility as a causer of effects, rather than presuming childish dependency on a Parental Deity, or “Great Other”. Such self-responsibility, He says, is required for gnosis—or genuine experiential knowledge—of the human condition, of the Inherently Love-Blissful Condition of all beings, and of the unique role of the Spiritual Adept in Revealing That Condition. • Is God a Being, or the Being, taking care of everyone? • If there is a God, then why isn’t God obviously just in charge? • Why do individuals who don’t believe in God very often seem to have a relatively enjoyable life, and believers just as frequently suffer? • If God is a Parent-Force, then why doesn’t the commitment to God bring into your life evidence that you are being protected and sustained?